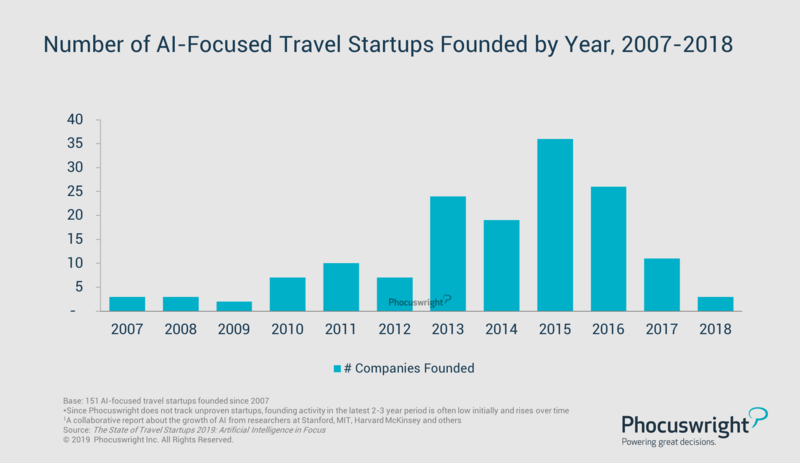 According to Phocuswright's latest travel research report, The State of Travel Startups 2019: Artificial Intelligence in Focus, AI is evolving from a trend to be watched to a force majeure. AI is currently being integrated into every conceivable corner of the industry, and it is beginning to shift industry dynamics, affording new opportunities for travel brands to rethink business processes, optimize advertising, increase customer engagement, improve customer support and so much more. When it comes to AI, where data is fuel, travel startups are by definition at a disadvantage because they typically do not have large data sets to work with to train their models. Thus, at first glance, massive incumbents like GDSs and OTAs appear to have an insurmountable advantage. The number of AI-focused travel startups founded each year has grown in fits and starts, and peaked in 2015. * The 2015 growth spurt correlates closely to many of the metrics tracked in the 2018 AI Index (1) report, and is likely linked to the availability and ease-of-use of open source AI developer solutions hitting critical mass, including Tensorflow (Google), Watson (IBM), Pytorch (Facebook), mxnet (Amazon), Acumos (Linux) and dozens more. But startups often come out on top following waves of disruption because of their ability to rethink how the industry should work from scratch. No matter how intimidating the incumbents, startups always find a way. Many of the most innovative AI-focused travel startups are figuring out how to leverage third-party data in unique ways to build an initially useful product, then scale a proprietary data set on top of it. Phocuswright's The State of Travel Startups 2019: Artificial Intelligence in Focus highlights founding, funding and category trends among AI-focused travel startups, and maps out a landscape of interesting companies in the space. To read the report, purchase it here, or subscribe to Phocuswright Open Access to unlock this – and our entire research library – for your company. Technology advancements continue to change travelers' attitudes and behaviors. Reliance on smartphones impacts consumers daily. New techs are gaining momentum. Join Phocuswright in its groundbreaking study that quantifies, qualifies and compares the use of technology by travelers from 7 countries (China, France, Germany, Indonesia, Japan, the U.K. and U.S.) during the entire trip life cycle. CLICK HERE to lean more about this Phocuswright Special Project. Phocuswright Europe highlights a collection of travel innovators spanning from startups to established companies on 15 May in Amsterdam. Get your ticket now to see the entire 15-16 May program in action.